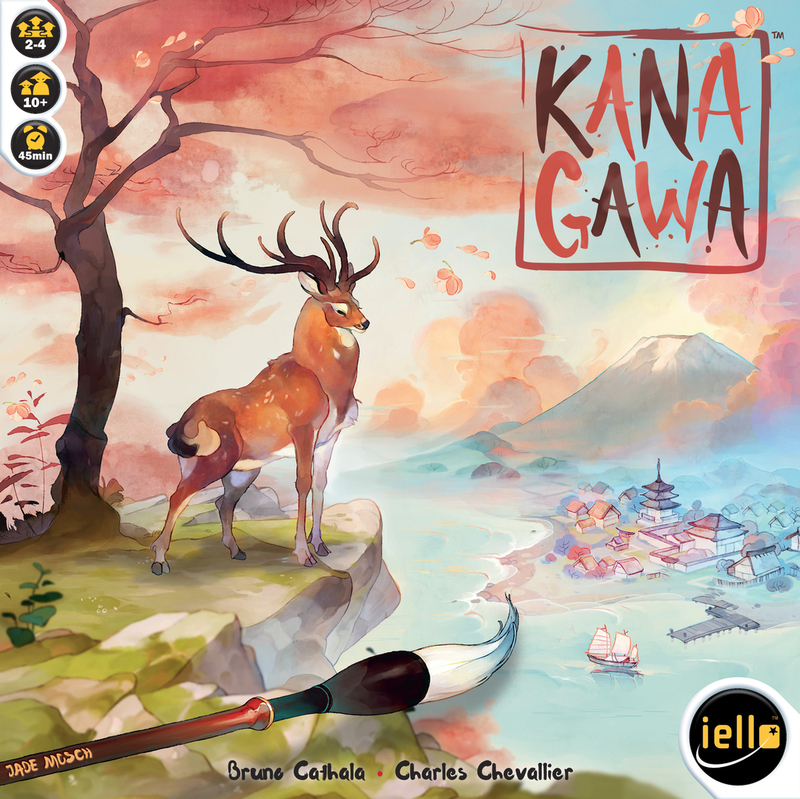 Kanagawa is a game by Bruno Cathala and Charles Chevallier, published by IELLO. It is for 2-4 players. In this game, players take on the role of a disciple of the greatest artist in Kanagawa, Master Hokusai. They will be following his teachings as they try to expand their studio and paint the most harmonious and beautiful print. They will be trying to gain diplomas in several different areas as they assign their brushes to the landscape. In the end, the player that can gain the most Harmony points will be declared the winner. To begin, the School board is placed in the middle of the play area. The first player is chosen and is given the Grand Master and Assistant pawns. Each player is given a random Starting tile and 2 brush pawns, which are placed in front of themself. The Lesson cards are shuffled together and placed face down next to the board. The Diploma tiles are all sorted face up by color and then by Harmony value. They are placed in 2 rows above the board, with the Diplomas associated with Prints at the top and the Diplomas associated with Studios on the bottom. Once all this has been set up, play now begins. The game is played over several rounds. Each round is divided into 3 steps; Follow the teachings of the Master, Broaden your knowledge or Put it into practice and New lesson. The first step is to Follow the teachings of the Master. In this step, the player with the Grand Master pawn will draw Lesson cards to be placed onto the first row of the School board. The number of cards drawn is dependent on the number of players. Some cards are placed face up and some are placed face down, depending on what the board shows. In a 4 player game, 4 cards are drawn with the third card placed face down. The second step is to broaden your knowledge or put it into practice. Beginning with the first player and continuing in turn order, each player will decide which of the two they want to do. If they decide to broaden their knowledge, they will pass their turn and will not take any Lesson cards. It should be noted however that if there is only 1 player remaining at the beginning of this step, they must put their knowledge into practice. To put their knowledge into practice, the player will choose one of the columns of Lesson cards taking all the cards in the column. They will then continue their work. This involves either improving their studio or expanding their print. To improve their studio, the player will turn over the Lesson card and place it under the bottom half of their Starting tile. This will expand and improve their studio allowing the player to immediately use the effects on it. To expand their print, the player must be able to match the combinations of Brush and Landscape as shown on the card. Any brush that has not been placed in a player’s studio may be placed on any empty Landscape icon in their studio. Players can also move brushes to match the icons of the print using the corresponding icons in their studio. It should be noted that a player may split their cards between their Studio and their Print in any way they like. Once the player is done continuing their work, they may take any corresponding Diplomas. As long as the player’s print meets the requirements of one of the Diplomas, they must choose to either take the Diploma or leave it. If they take it, they will place it next to their Print. It should be noted that a player may only take one Diploma of each color. This means that they would not be able to take a higher value one later. If they leave the Diploma, they can try to take a higher value Diploma later once they meet the requirements for it. However, they will no longer be able to take the one that they left behind. The third step is a new lesson. As long as their are still players that haven’t taken any Lesson cards, the first player will draw as many Lesson cards as there are players remaining. The new cards will be lined up below the cards that remain on the School board in either face up or face down position, depending on the space on the board. Once this has been completed, the players that remain will go back to step 2 and either broaden their knowledge or put it into practice. If any players decide to broaden their knowledge again, Lesson cards will then be added to the third row of the board in the same way. Once this third row is filled, any remaining players must put their knowledge into practice and take all the Lesson cards in a column. Once all the player have taken a column of Lesson cards, the round ends. The player with the Assistant pawn will now take the Grand Master pawn making them the first player for the next round. The game continues until one of two conditions is met. If the last Lesson card is added to the School board, players that have yet to take a column of Lesson cards must choose a column in turn order. At the end of the round, the game ends and scoring occurs. The game can also end at the end of a round when a player has at least 11 cards in their Print. Players gain points for each Lesson card in their Print including their Starting tile. They also gain points for the longest sequence of indentical Seasons in their Print. They get points for Harmony icons on their Lesson cards and Diploma tiles subtracting any symbols that are crossed out. They will also gain points for having the Grand Master pawn. Each player will then add up their points and the one with the most Harmony points is the winner. This is a really beautiful looking game. In a lot of ways the artistic look and feel of the game remind me of Tokaido. The Lesson cards in this one make me think of the Panorama cards in that one. I really like the serene beauty of this game. It comes with the Lesson cards that I just mentioned. These are are completely square and are more like the size of tile except they have the thickness of a card. The Starting tiles, Diploma tiles and Storm tokens are all thick cardboard. The Diplomas are brightly colored with different iconography on them. The Storm tokens fit in with the same artistic style as that of the Lesson cards. The Grand Master and Assistant pawns, as well as the brush pawns are all made of wood. These are very nice and fit in thematically well with the game. The School board is made of bamboo and rolls up like those old Chinese wall calendars that you used to be able to find all over the place. Honestly this is the only part of the game that I don’t like. I really wish the board had been just that, a board. Thematically it looks nice and fits in well, but functionally I feel like it isn’t that nice and looks like it will fall apart rather easily. As a matter of fact, my board already has some stray threads on the back of it that are just waiting to cause problems. That was just on opening the box. While I like the look and feel of the game, this one piece ruins my overall love for an otherwise great looking game. The rulebook for this game is designed very well. It walks you through the different steps and concepts of the game like a peaceful stroll through the park. There are lots of great looking pictures and examples throughout the book. Every aspect of the game, from the cards to the tiles, are explained in great detail. The book also has a nice section devoted to the explanation of each of the different Diploma tiles. There’s also a reminder of the different effects that each icon provides on the back page, as well as the structure of a round for reference. Overall, this book gives me that zen like feel that many of the components do. It’s really beautiful and a visual treat. I like it a lot. As I’ve mentioned earlier, this has a really calm and peaceful, zen like feel to it. It’s not a difficult game to teach or play. It’s actually fairly simple. However there are some serious choices to make. Such as when to take a column from the School board and whether to use the cards on your Print or in your Studio. Knowing how to manipulate your brush pawns to be able to get the most out of them and to be able to pay for the Lesson cards is the key. Another major choice to make is do you go ahead and take the Diploma tile that you just met the requirements for, or do you hold out and hope that your opponents don’t keep you from getting the Lesson cards you need to be able to meet the next higher requirements. I know those types of choices sound stressful, but they’re not. As I’ve already said, the game gives me the same feelings that I get when I play Tokaido. I like how beatiful that your tableau looks in front of you at the end of the game. This is just a fun game that looks great. Fans of games like Tokaido or other artistic games should really enjoy the look and feel of this one. Worker placement and card drafting fans should also like this one. This is a game that I would recommend. Overall it’s a masterpiece that you can actually play. Kanagawa is a beautiful artistic game that allows players to bring out their inner artist. It doesn’t take a very long time to play. Most game sessions last around 45 minutes. The components are beautiful. I especially like the peaceful look and feel of the Lesson cards. I was a little disappointed in the board. 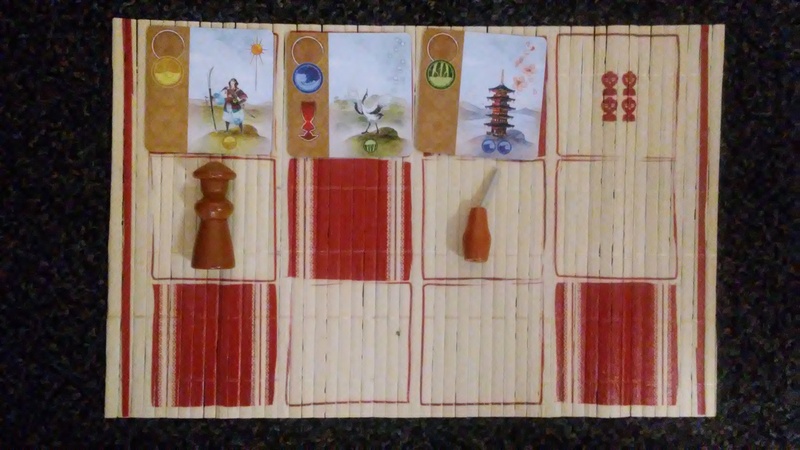 I feel like the bamboo board, while it works with the theme, won’t hold up to a lot of play. I may be wrong, but that’s my thoughts on it anyway. The game itself is not only a visual treat but also a beauty of design. It combines elements of worker placement, card drafting and set collection. The game is a lot of fun and gives me that same zen like feel that I get when I play Tokaido. Fans of Tokaido or other artistic games should really enjoy this one. I also think fans of simple worker placement or card drafting games will like this one too. Overall, this is a game that I like, not only the theme and look of, but also the actual game itself. It’s very enjoyable. I would recommend this one. It’s a work of art. This entry was posted in Reviews and tagged board, board games, bruno, bruno cathala, card, card games, cathala, charles, chevallier, games, iello, iello games, kanagawa. Bookmark the permalink.